Several of months ago, we had the pleasure of working with Melissa Bigner, the editor of Charleston Weddings; Roo Way, a fantastic photographer; and Renato Poliafito, the owner of Baked, to create a mock wedding dessert spread. We were challenged with the task of designing materials that any bride could make and assemble. 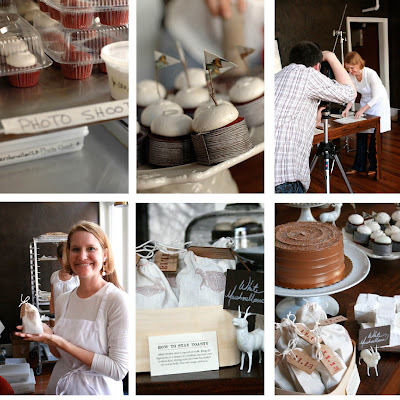 Stamps, cloth bags, twigs, vintage prints and lots of amazing desserts made for a beautiful shoot. Look for the full story this month in Charleston Weddings. 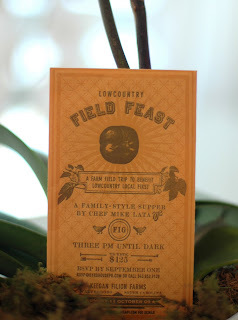 We just finished these invitations for Lowcountry Field Feast, a field dinner to benefit Lowcountry Local First, an organization that advocates the benefits of a local living economy. Charleston chef Mike Lata of Fig will be preparing the feast out of local and sustainable food. We wanted the invite to be sustainable as well as respresentative of the event. 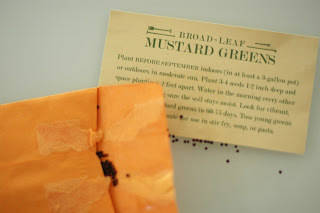 We letterpressed the invite on the front of small seed envelopes, filled the envelopes with heirloom seeds and addressed the backs of the envelopes. Simple and reusable. We just completed this set for a couple getting married in the mountains of South Carolina. This outside wedding will take place this fall in a meadow at the foot of the mountains. The bride provided us with images to get us inspired, it is truly a beautiful spot!